Do Triffids Like Nespera Jam? We have recently returned from three weeks away from Casa Torta to find that Things Have Been Growing. We’ve been away for this length of time before but I don’t recall such a rapid change in the undergrowth. It must be the time of year. 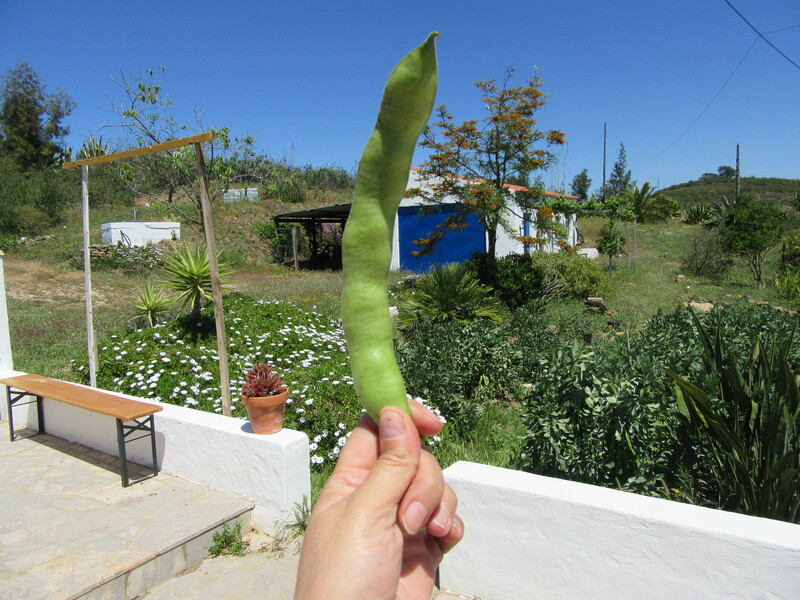 The broad beans are now of a greater population than that of the neighbouring village, and almost as big as a person. After picking them all (except for a few left to go to seed), the total yield was over 43kg, that’s over 700g per plant. Articles I had read suggested 300g of beans per plant would be reasonable, so I am very proud. Given that this is our first permaculture bed effort in a wintery Algarve, not known for its easy gardening. Phew! That’s a lot of soup/puree/ etc. Anyway, enough about the beans; I’m not obsessed with them, really. And I haven’t named any of them. OK? The other major growth in the garden is this stonking protuberance from the centre of our largest cactus, which I presume to be an agave. 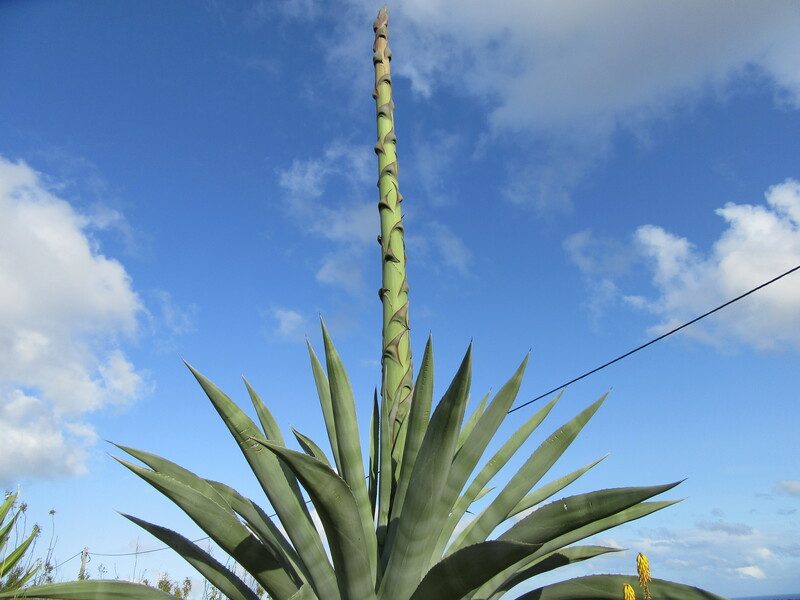 This entire stalk has emerged over a three week period, which demonstrates a pretty significant growth rate as it is must be around 8m tall. I am convinced that if I stand and watch it for long enough, I should be able to see it move. Cue much standing and staring at a stalk. Rest assured, Keith and I have pondered how we might measure its rate of growth, but have failed to work out how. Marking the stalk was an option, but getting to the stalk is a less attractive prospect, given the spikes. We’ve no idea how long it will take to do its thing, but wouldn’t be surprised to wake up and find that it’s moved into the house and is making itself a cup of tea. We have seen others around the hills all producing similar masts. It must be the time of year that they take over. Triffid nightmares are expected. 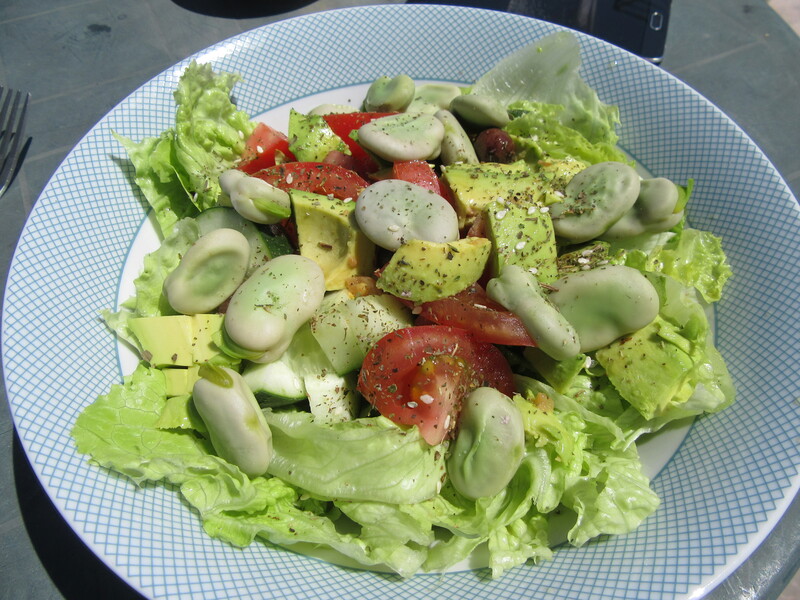 Aside from trying to harvest, eat and/or freeze all of the broad beans before they burst, I have also been keen to use up the nespera on the tree, as I hate things going to waste and I love food that is free. Salt of Portugal tell a lovely legend/tale as to how these Chinese fruits came to be in Portugal. 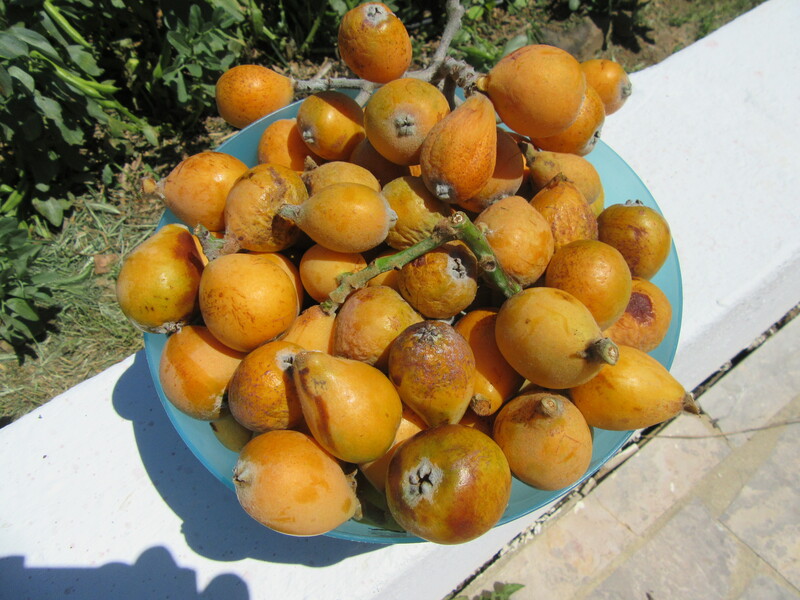 Much as I love to eat these little plums straight off of the tree, we are talking 100+ here and even I would struggle to get through that many – in between trips to the bathroom, I should expect. So, jam it is, then. Having searched the internet for recipes – it’s a simple process involving fruit and sugar and nothing else – I came across Azores Gal’s recipe for Nespera Jam and her tip for using the hand blender to mush them all up before sieving the skins out. 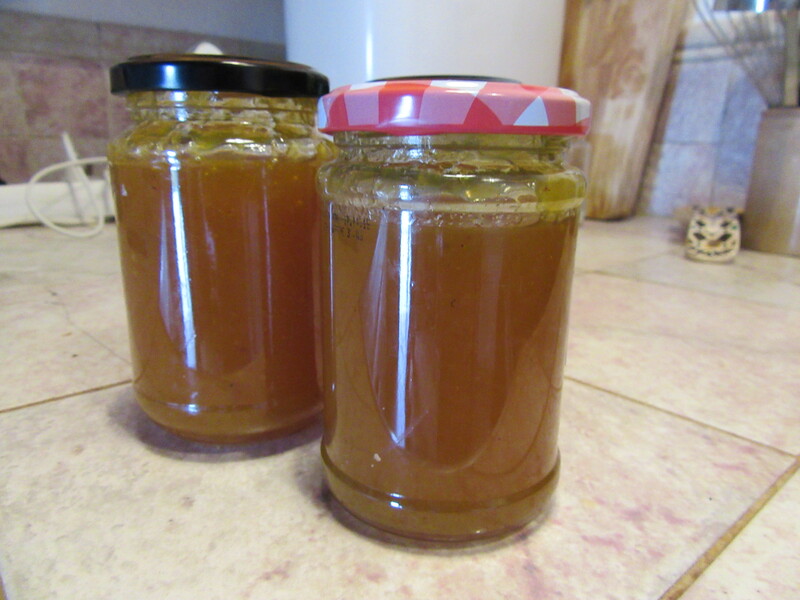 It worked a treat – no pectin needed as you don’t peel the fruit and it thickened easily and within half an hour post sieving. I shan’t bother to replicate her instructions here as she has done such a great job of explaining – with images – how to do it, I shall let her get on and do so. The resulting jam is simply beautiful to look at and really delicious; a kind of cross between quince jelly, marmalade and mango chutney. It could be eaten with both sweet and savoury accompaniments or just straight out of the jar with a spoon. Perhaps the triffid would like some. I come in peace.